Theopetra Cave inhabited by humans 130.000 years ago. The Cave of Theopetra, just 4 km away from Meteora is indeed a very unique archeological site, mainly because it has revealed many of our early history secrets, like the finding of the oldest known man-made structure on earth. This unique cave with its great location, its superb access to fresh clean water and its vantage point, it served like a magnet for those early inhabitants who could recognize from miles away such key advantages. So those early human settlers used it continuously for more than 130.000 years. Its uniqueness from an archeological perspective is that in contains, within a single site, the records of two greatly significant cultural transitions: The replacement of Neanderthals by modern humans, and the later transition from hunter-gathering to farming after the end of the last Ice Age. The cave consists of an immense 500 square meter rectangular chamber at the foot of a limestone hill, which rises to the northeast above the village of Theopetra, with a very big entrance 17m wide by three metres high. It lies at the foot of the Chasia mountain range, which forms the natural boundary between Thessaly and Macedonia prefectures, while the Lithaios River, a tributary of the Pineios River, flows in front of the cave. The small Lithaios River flowing literally on the doorsteps of the cave meant that cave dwellers had always easy access to fresh, clean water without the need to cover daily long distances to find it. 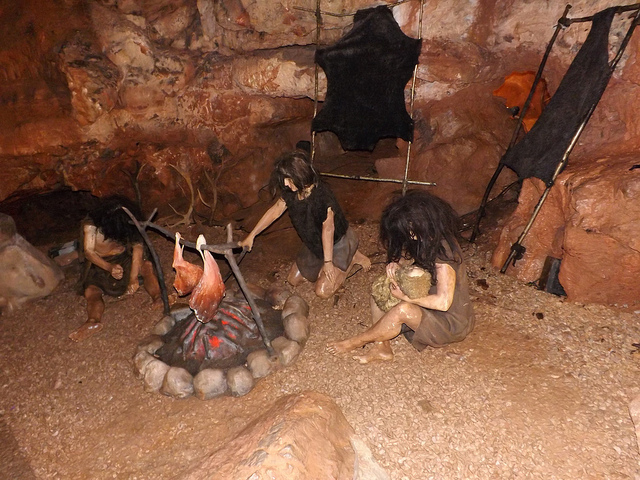 Specimens found, such as coal and human bones, prove that the cave was occupied from about 135,000 BC to 4000 BC, and that temporary use continued during the Bronze Age and historic times up to 1955. Even after that the cave was used occasionally to by shepherds to shelter their herds’ right up until the excavations began. It is the first time that cave dwelling was recorded in Thessaly during the Palaeolithic period. 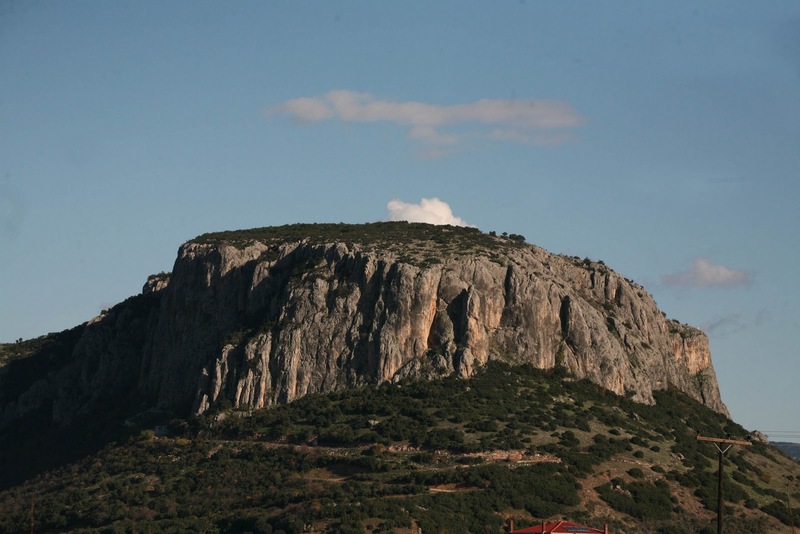 The latest cave findings published in 2012 by the lead scientist and its team responsible for the excavations, Paleoanthropologist Dr. Ekaterini (Nina) Kyparissi-Apostolika, has raised the time records of cave’s dwelling up to 135.000 BC. Excavations brought to light three human footprints which have been dated to approximately 135,000 years ago. The find consists of four human footprints in a row, from four individuals believed to have been children aged 2 to 7. Those children must have walked on the remained ashes of a fire that later in time it became petrified and thus allowing footprints to be preserved till present day.The stratigraphic sequence of Theopetra cave extends through three cold periods: during the Middle era circa 25,000 BC, during the Upper Palaeolithic, and during the final Upper Palaeolithic period (end of the Pleistocene era). The excavations and study of the finds at Theopetra have been conducted since 1987 by the scientific research group of the department of Paleoanthropology-Speleology, as we have already mentioned earlier under the direction of Dr. Ekaterini (Nina) Kyparissi-Apostolika. Objects discovered in the cave include stone tools of the Palaeolithic, Mesolithic and Neolithic periods, as well as Neolithic pottery, bone and shell objects, skeletons from 15000, 9000 and 8000 BC, and traces of plants and seeds that reveal dietary habits. Back in 2010 it was announced that according to an optical dating test known as Optically Stimulated Luminescence, that performed to date a recently excavated stonewall and applied on quartz grains nested within the stones, it surprisingly revealed the oldest known man-made structure. 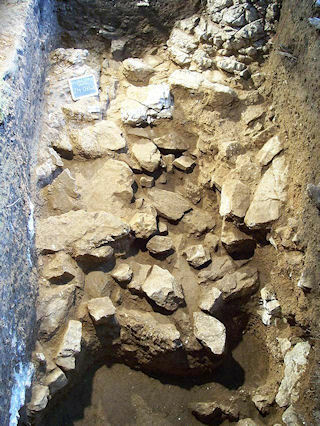 The 23,000 year old stone wall in front of Theopetra cave probably built to protect its residents from cold winds at the height of the last ice age, is the oldest known example of a man made structure! 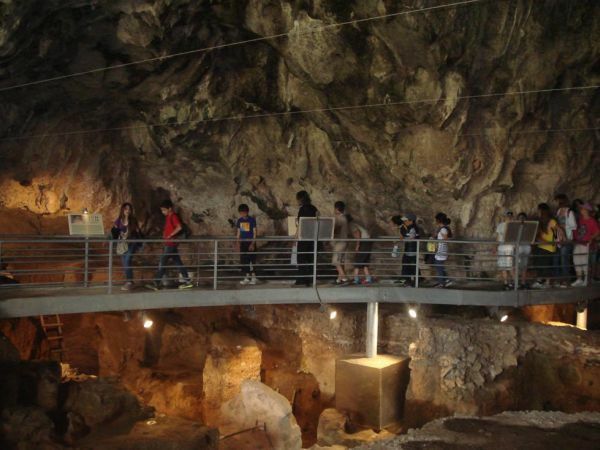 If visiting Meteora then Theopetra Cave is definitely a site not to be missed by anyone! This entry was posted in Theopetra cave and tagged caveman, Meteora, paleontology, prehistory, Theopetra cave, Trikala. Bookmark the permalink.